Before fleeing England to escape persecution as a Puritan, clergyman John Cotton gave the following sermon in 1630 for members of his congregation who were immigrating to America. Cotton drew parallels between the ancient Israelites and the Puritans to illustrate his belief that it was God’s will for the Puritans to immigrate to the new world and occupy the land as they saw fit. 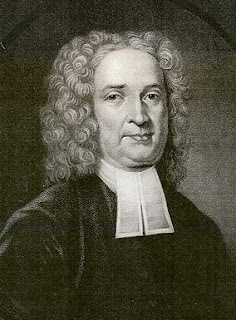 Cotton became a respected and influential clergyman in the Massachusetts Bay Colony, where he settled in 1633 and remained until his death. The placing of a people in this or that country is from the appointment of the Lord…. Quest. Wherein doth this work of God stand in appointing a place for a people? Answ. First, when God espies or discovers a land for a people, as in Ezek. 20:6: "He brought them into a land that He had espied for them." And, that is, when either He gives them to discover it themselves, or hears of it discovered by others, and fitting them. Second, after He hath espied it, when He carrieth them along to it, so that they plainly see a providence of God leading them from one country to another, as in Ex. 19:4: "You have seen how I have borne you as on eagles' wings, and brought you unto Myself." So that though they met with many difficulties, yet He carried them high above them all, like an eagle, flying over seas and rocks, and all hindrances. Third, when He makes room for a people to dwell there, as in Ps. 80:9: "Thou preparedst room for them…." Now, God makes room for a people three ways: First, when He casts out the enemies of a people before them by lawful war with the inhabitants, which God calls them unto, as in Ps. 44:2: "Thou didst drive out the heathen before them." But this course of warring against others and driving them out without provocation depends upon special commission from God, or else it is not imitable. Second, when He gives a foreign people favor in the eyes of any native people to come and sit down with them, either by way of purchase, as Abraham did obtain the field of Machpelah; or else when they give it in courtesy, as Pharaoh did the land of Goshen unto the sons of Jacob. Third, when He makes a country, though not altogether void of inhabitants, yet void in that place where they reside. Where there is a vacant place, there is liberty for the sons of Adam or Noah to come and inhabit, though they neither buy it nor ask their leaves …. So that it is free from that common grant for any to take possession of vacant countries. Indeed, no nation is to drive out another without special commission from Heaven, such as the Israelites had, unless the natives do unjustly wrong them, and will not recompense the wrongs done in a peaceable fort [manner]. And then they may right themselves by lawful war and subdue the country unto themselves…. This may teach us all, where we now dwell or where after we may dwell: Be sure you look at every place appointed to you from the hand of God. We may not rush into any place and never say to God, "By Your leave." But we must discern how God appoints us this place. There is poor comfort in sitting down in any place that you cannot say, "This place is appointed me of God." Canst thou say that God made room for thee, and there hath settled thee above all hindrances? Didst thou find that God made room for thee either by lawful descent, or purchase, or gift, or other warrantable right? Why, then, this is the place God hath appointed thee; here He hath made room for thee, He hath placed thee in Rehoboth, in a peaceable place. This we must discern or else we are but intruders upon God. And when we do withal discern that God giveth us these outward blessings from His love in Christ, and maketh comfortable provision as well for our soul as for our bodies by the means of grace, then do we enjoy our present possession as well by gracious promise as by the common, and just, and bountiful providence of the Lord. Or, if a man do remove, he must see that God hath espied out such a country for him…. Quest. But how shall I know whether God hath appointed me such a place, if I be well where I am, what may warrant my removal? Answ. There be four or five good things, for procurement of any of which I may remove. Second, there be some evil things, for avoiding of any of which we may transplant ourselves. Third, if withal we find some special providence of God concurring in either of both concerning ourselves, and applying general grounds of removal to our personal estate. First, we may remove for the gaining of knowledge…. Second, some remove and travail for merchandise and gainsake: "Daily bread may be sought from far" (Prov. 31:41)…. Third, to plant a colony, that is, a company that agree together to remove out of their own country, and settle a city or commonwealth elsewhere. Of such a colony, we read in Acts 16:12, which God blessed and prospered exceedingly, and made it a glorious church…. Fourth, God alloweth a man to remove when he may employ his talents and gift better elsewhere…. Fifth, for the liberty of the ordinances…. This case was of seasonable use to our fathers in the days of Queen Mary, who removed to France and Germany in the beginning of her reign, upon proclamation of alteration of religion, before any persecution began…. There be evils to be avoided that may warrant removal: First, when some grievous sins overspread a country that threaten desolation…. Second, if men be overburdened with debts and miseries…. Third, in case of persecution…. As these general cases, where any of them do fall out, do warrant removal in general; so there be some special providences or particular cases which may give warrant unto such or such a person to transplant himself, and which apply the former general grounds to particular persons; first, if sovereign authority command and encourage such plantations by giving way to subjects to transplant themselves and set up a new commonwealth. This is a lawful and expedient case for such particular persons as be designed and sent: Matt. 8:9: "And for such as they who are sent have power to command." Second, when some special providence of God leads a man unto such a course. Source: Articles from Bibliobase edited by Michael A. Bellesiles. Copyright © 1998 by Houghton Mifflin Company. All rights reserved.